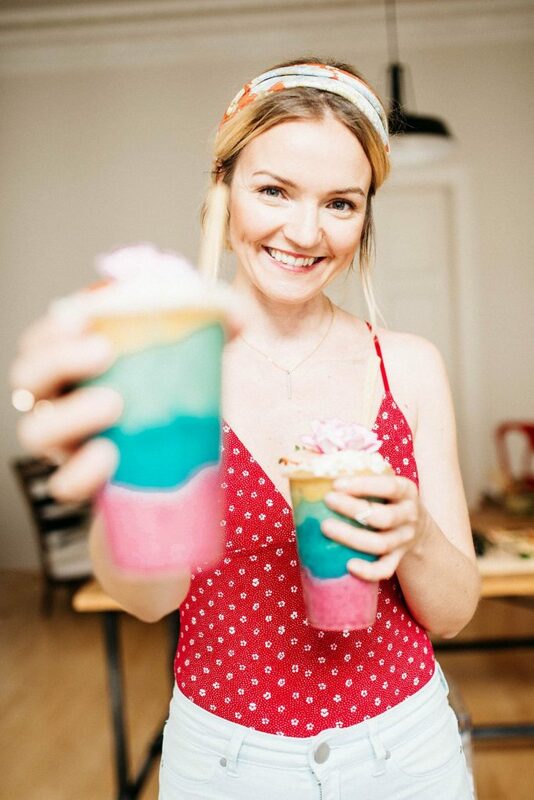 A quick recipe for you friends before heading off to Switzerland to visit my BFF for the weekend for some yoga, baking and hike the Swiss mountains! Sounds like a good weekend to you? Sure does to me! 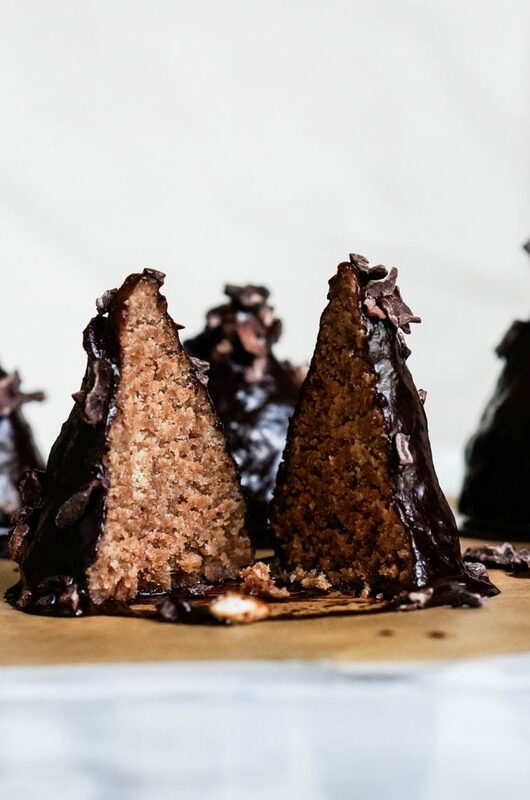 This recipe for these Vegan Cookie Dough Rum Cones is perfect for those days where you don’t have any fancy ingredients in the house but still crave a doughy satisfying treat that looks cool as well. 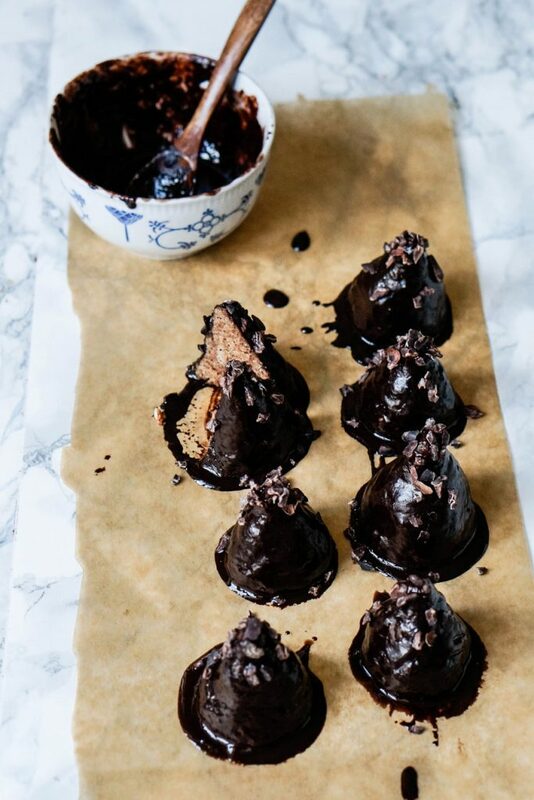 I actually think I got a bit carried away looking forward to my mountain getaway as these little Cookies Dough Rum Cones look like little mountains coated with DIY chocolate, don’t ya think? I created a super simple vegan chocolate cookie dough using oats and cashews as the basis. I kept it plain and simple with a hint of Rum (use real rum for an adult version!). But how about adding some cocoa nibs for a chocolate speckled cookie dough? That would be quite cool, right? So go ahead and make yourself a delicious weekend treat! In your blender or food processor add the oat flour, baking powder,cocoa powder, salt, vanilla, and cashews and blend well. Then add the dates, rum aroma, melted cocoa butter and milk and blend again until you end up with a sticky soft dough. Remove from the blender and chill in the fridge for 10 minutes. Divide into 8 little balls, forms cones with your hands and return to the fridge to chill for another 10 minutes. Prepare the chocolate coating by mixing the ingredients and dip the cones in chocolate and let them set on a lined tray. Transfer to the fridge to speed up the process. Store your Vegan Cookie Dough Rum Cones in the fridge in an airtight container! Try my for Coconut Oil Chocolate and my TimTam’s for more raw wholesome sweets!